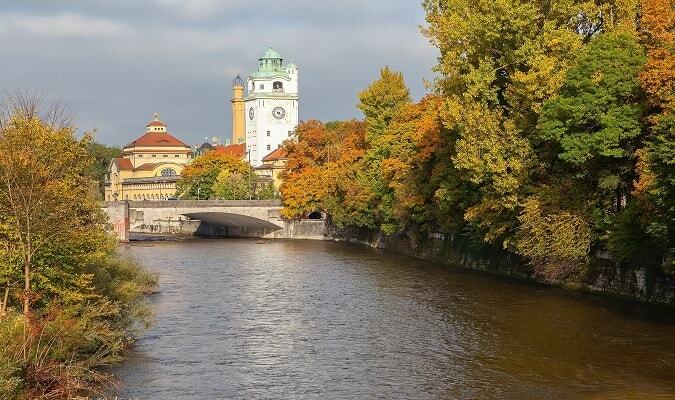 Munich is the capital of Bavaria and Germany‘s third largest city on the banks of the Isar river and the Alps. The Frauenkirche was completed in 1488. It is one of the symbols of Munich. It has 109 meters long and 40 meters wide and two twin towers with 10 meters high and its Renaissance domes. The Residenz served as the seat of government and residence of the Dukes of Bavaria, electors and kings from 1508 to 1918. It began in 1385 as a castle in the northeast corner of the city. It was transformed by the rulers over the centuries into a magnificent palace, buildings and gardens. 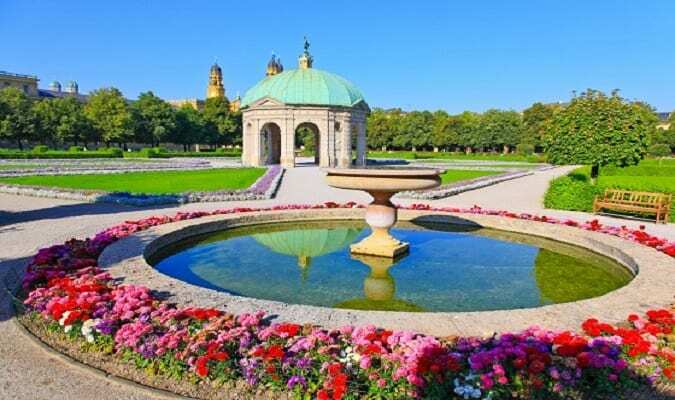 The creation of the Hofgarten began in 1613 at the same time that extensions and buildings were erected by the Duke Maximilian I. The garden has been redone several times. A restoration work was made after World War II. Marienplatz is the central square of Munich since 1807. In addition to the Neues Rathaus you will find the building of the old Town Hall (Altes Rathaus) with its reconstructed tower. Another notable landmark is the Mariensäule. Marienplatz is also a popular shopping destination and has several department stores and restaurants. Hofbräuhaus is Munich‘s most famous brewery. The location is ideal to try the Bratwurst, Pretzel and a beer in one of those large glasses. The Englisher Garten is not only the largest urban park in Germany, covering an area of 910 acres with more than 100 bridges, it is also one of the most beautiful. The Nymphenburg Castle is located in the western part of Munich. The castle owes its foundation as a summer residence for the birth of the expected heir to the throne, Max Emanuel, born in 1662, son of the prince elector Ferdinand Maria and Adelaide of Savoy. The Olympiapark was built in 1972 for the Olympic Summer Games and represents one of the most impressive testimonies of modern Munich. The BMW Musem is located in the immediate vicinity of the Olympiapark. The vehicles and motors on display illustrate the history of cars, motorcycles produced in the Bavarian factories. The Deutsches Museum is located on the banks of the Isar river. It was founded in 1903 and is among the oldest museums in the world of science and technology. The Allianz Arena is located in the northern part of Munich. It was inaugurated in 2005. It is one of the most modern stadiums in Europe. The Maximilianstrasse is one of the main avenues in Munich. The western part of the avenue is known for its galleries, designer shops, luxury boutiques. The Nationaltheater is a historic opera house. It houses the Bavarian State Opera, the Bavarian State Orchestra and the Bavarian State Ballet. The Karlstor served as the main defense fortification of Munich in the Middle Ages. It is located in a portion of Munich‘s pedestrian area a few minutes from the Marienplatz. It is one of the busiest areas in the city. The Isartor is one of the 4 gates of the ancient fortification of medieval Munich. It was built in 1337. The tower houses today a humorous museum dedicated to Karl Valentin. The Siegestor is a 3-arched door with a Bavarian statue with a lion chariot. The Siegestor is 21 meters high. The Odeonsplatz is a large public square in the center of Munich. The square has traditionally been an important venue for public events. 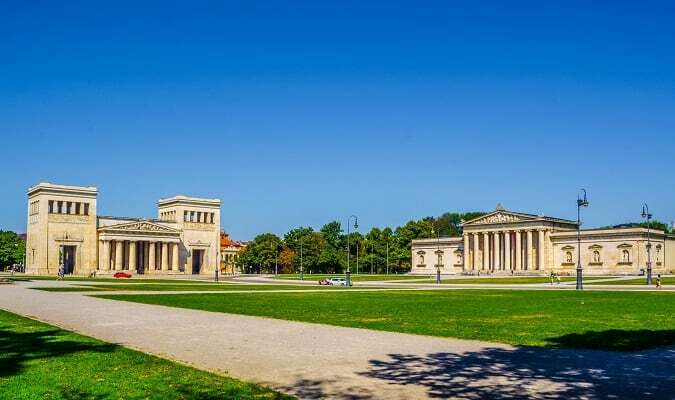 The Königsplatz is a 19th century square with neoclassical style. The area around the square houses the Kunstareal. It is composed of three “Pinakotheken” (Alte Pinakothek, Neue Pinakothek and Pinakothek der Moderne), the museums Glyptothek and the Staatliche Antikensammlung specialized in Greek and Roman art. The Viktualienmarkt is a daily market located in a square in the center of Munich. The market has approximately 140 stalls offering flowers, fruits, juices, cheeses. The Isar river is a tributary of the Danube River. It has an extension of 295 km. The source of the river is in Karwendel and from there runs through Munich. The Sendlinger Tor is located at the south end of the city in the old town of Munich. It separates the old town from the Isar suburb. Dachau is located 20 km from Munich. It is famous for its Concentration Camp built by the Nazis in 1933. 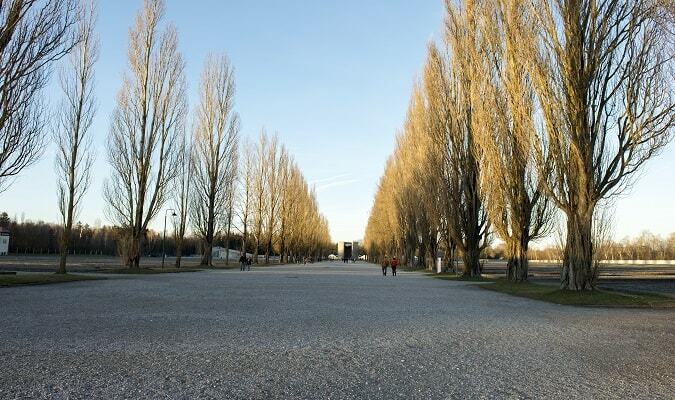 The Dachau Concentration Camp was the first camp built in Germany. Today it houses a museum about the prisoners and their journey to death or liberation through their biographies. The Hilton Munich is located in the Haidhausen district. The Europa Munich is located 6 minutes by tram from the Karlsplatz. The hotel has 162 rooms equipped with a flat-screen TV, work desk, minibar. The Aloft Munich is located in the heart of the city. Rooms are equipped with a flat-screen TV, safe. The Eurostars Munich is located near the Central Station. Rooms are equipped with a flat-screen TV, safe, minibar, coffee maker. The hotel has a swimming pool and a sauna. The Oberpollinger is an elegant space that has several luxury brands of clothes, accessories. The beauty department is the largest in the city. The Fünf Hofe has exclusive shops, bistros and cafés. The Outlet Ingolstadt Village is located 40 minutes from Munich. It was opened in 2005 and has more than 70 boutiques. Brands: Armani, Escada, Calvin Klein, Coach, Gucci, Jimmy Choo. Munich has easy train access from various cities in Germany. Famous cities nearby: Füssen, Garmisch-Partenkirchen, Augsburg, Regensburg.